GOLD'S GYM GOLDS GYM Nashik- Gold’s Gym, Nashik was started on 1st Jan.2009 in Nashik. This was the first Gold’s Gym in 3 tier city. This Gold’s Gym was started by Mr.Rajesh Girme, a Tea planter Assam, but having keen interest in Fitness. Gold’s Gym, Nashik changed the Fitness Scenario completely in Nashik & generated interest in people to take up fitness in a big way.. Gold’s Gym, Nashik is unique as it has so many facilities under one roof which will be difficult to get in any other Gym. The directors believe in providing best modern facilities along with conventional workouts. HISTORY: Gold’s Gym started in Venice California in 1965, and soon became the hotbed for the development of training techniques, equipment and nutritional concepts that formed the foundation for the modern fitness revolution. In 1975, Gold’s Gym received international attention when it was featured in the major motion picture, Pumping Iron’.It starred by many body building champions including two that would follow in the footsteps of Steeve Revees;Arnold Schwarzenegger and Lou Ferrigno. It was thus effectively established as the “Mecca of Body Building”. Today, Gold’s Gym has over 700 facilities. It is now the largest international gym chain in the world recognized for its passion, unique heritage, and experience as the final authority in fitness and lifestyle. GOLDS GYM INTERNATIONAL MISSION STATEMENT Gold's Gym is the largest gym chain in the world, recognized for our passion, unique heritage and experience as the authority in fitness. We will inspire our members with unrivaled energy and provide the finest fitness equipment and fitness knowledge available to help our members achieve their individual potential. GOLDS GYM INTERNATIONAL VISION STATEMENT To positively change people lives by providing the Ultimate Fitness Experience. Gold's Gym Nashik Services. 1. Unisex Gym well equipped gym over 60 cardio stations & 3-4 machines for each muscle. 2. Separate Ladies Gym, only Gold’s Gym in India to provide this facility. 3. Travel Pass to all Gold's gyms in india & world. 4. Spinning 5. HIIT (High Intensity Interval Training) 6. Aerobics, Step Aerobics. 7. Zumba 8. Kick Boxing, MMA 9. Taekwondo 10. Functional Training 11. Cross Fit 12. 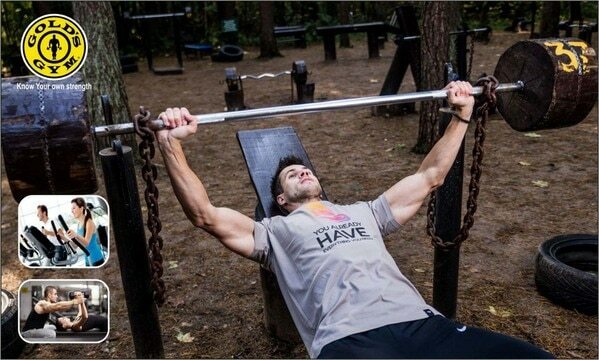 Outdoor Gym 13. Kettle Bell, Rip-60 14. Yoga, Rope Yoga 15. Ancient workouts 16. Personal Training 17. Weight Loss, Weight Gain 18. Nutrition Counselling. 19. Massage 20. Steam Bath & Lockers 21. Transfer Facilities (in all branches) (Gym to Gym & Member to Non -member) 22. Green Gym 23. Jogging Facility on Terrace. GOLD'S GYM NASHIK- PROFILE Gold’s Gym, Nashik was started on 1st Jan.2009 in Nashik. This was the first Gold’s Gym in 3 tier city. This Gold’s Gym was started by Mr.Rajesh Girme, a Tea planter Assam, but having keen interest in Fitness. Gold’s Gym, Nashik changed the Fitness Scenario completely in Nashik & generated interest in people to take up fitness in a big way. Gold’s Gym, Nashik is unique as it has so many facilities under one roof which will be difficult to get in any other Gym. The directors believe in providing best modern facilities along with conventional workouts. Gold's Gym Nashik is one of best gym in nashik. it is Unisex Gym & well equipped gym over 60 cardio stations & 3-4 machines for each muscle exercise. MISSION Gold’s Gym Nashik’s mission is to provide fitness suitable for all age groups to achieve sustained fitness & stay fit and healthy for life. Golds gym is best Gym in canada corner nashik.